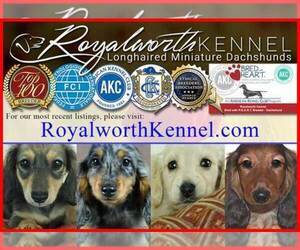 Welcome to Royalworth Kennel. We are second generation breeders and caretakers of the wonderful miniature long-haired dachshund. Our foundation dogs come from the finest international lines and are carefully bred to produce pups with the best possible, health, personality and beauty. Our dogs come with life-time warranty and boarding privileges. Please visit our website, RoyalworthKennel, or call us, +1 (352) 464-8063, for the most up-to-date information on available pups and dogs, and contact us with any questions. We are always pleased to speak with other dog lovers! We are a very small in-home breeder of AKC Miniature Dachshunds. We focus on early socialization and training in order to produce well-rounded and well-mannered companions that will live happy lives! Our structure comes from the Puppy Culture protocol (.puppyculture) and the work of Dr. Ian Dunbar (.dunbaracademy and .dogstardaily). We like to stay in touch with every family who has one of our puppies, and we consider each one a good friend. Therefore, we can offer references on request, and we are always learning from our puppy families. Please visit our Facebook page for regular updates, and also visit our website, which we keep as a resource-rich environment even when we don&amp;amp;amp;#039;t have puppies available. We strive to provide the most current information about training, health, raw feeding, and pet supplies at all times, and we have many free resources linked on our site for dog families, whether or not they happen to be part of our dachshund family! Show and Pet quality puppies. 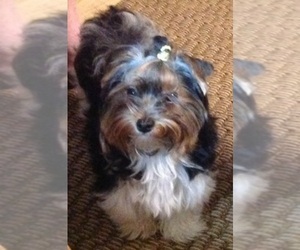 I am a home breeder with 35 years both in the show ring and producing show and pet puppies. I have many AKC Champions, Grand Champions up to a Bronze level. I also have Titles for Earth Dog, Barn Hunt, Rally and Obedience. My efforts for puppies are Conformation and Temperament. I pride myself in producing quality dogs. I am always first about the type of home my puppies get. At anytime please feel free to contact me. We are a small breeder of long haired miniature dachshunds. Our puppies come with limited, possibly full, AKC registration, with an occasional litter being registered with CKC. Check out our Facebook page - Divine Doxies of Arkansas. We raise Registered Purebred Miniature Dachshunds. Our puppies are the joy of our lives! We live on a 70 acre farm so they have lots of room to explore. I am a stay at home wife and we have 2 females and 1 male that we have litters with several times a year. Our dogs/ pups are housed in a small cozy climate controlled building with concrete runs but are allowed to run and play in the yard during the day... I also find homes for some of my friends puppies as well which is why i sometimes have various breeds. Looking for a reputable Dachshund breeder in your area? Simply browse through our nationwide directory of 1000s reputable Dachshund breeders - complete with website addresses, dog breed profiles, and current puppies for sale.